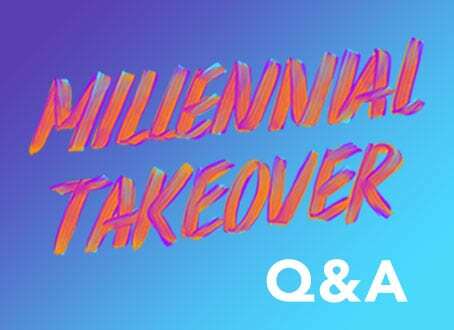 Every year, MCON—the Millennial Engagement Conference—is a great chance for us to celebrate how Millennials are changing the world, and to talk to conference attendees about how they’re getting involved with the causes that matter most to them. Since this year’s MCON coincided with our 20th anniversary where we’re rallying people to “Get in the Arena” we partnered with Comcast NBCUniversal who brought along their Chat Box. We invited attendees to jump in and record their answers to the question “How are you using technology and innovation to #GetInTheArena and inspire change in your community?” We received nearly a hundred video stories from attendees about how they are turning their interest into action. A #GetInTheArena moment that stood out to us came from Elizabeth Lindsey, Executive Director of Byte Back, who talked about how she and the organization teach DC area adults technology and help them find tech jobs. Her story stood out to us because of its mission similar to ours with Inclusive Entrepreneurship, where we work to promote the recognition and success of underrepresented entrepreneurs. Similarly, Byte Back propels underserved DC area residents to career success through adult education. We wanted to learn more about Lindsey’s vision for Byte Back, her #GetInTheArena inspiration and motivation, and how the organization is setting new goals for their 20th anniversary and beyond. Read on for more about Lindsey and Byte Back. Can you tell us about Byte Back and your vision for the organization? Byte Back is a Washington, DC based nonprofit providing free technology education and career training to unemployed adults. We teach our students tech skills from the very beginner level—how to use a mouse, how to send an email—to advanced IT skills that prepare them for careers in IT and business services. I’ve been the Executive Director here for two years, and we’ve been serving people in DC for 20 years. Byte Back is one of the only organizations in the country where someone with limited access to technology can start with the basics and move up a training pathway to IT skills training and into living-wage careers that use technology. I know that communities beyond DC need us. This year we’re expanding into Maryland, and we’re excited to continue planning how we can expand our reach even farther. What inspired you to “Get in the Arena” on this cause? I’m the first person in my family to go to college and grew up in a very financially unstable home. My life was completely transformed by having access to quality education, and I’m passionate about helping others access these same types of opportunities. I know there are so many opportunities in today’s society for people without college degrees, people like my parents, to build careers that can help them to support their families and thrive. 31 million Americans have low tech skills. There are 5.5 million more women in poverty than in 2000. And only four percent of the tech workforce is made up of women of color. Imagine what poverty in this country would look like if people on the other side of the digital divide were given the opportunity to have living-wage careers in tech. There are diverse people who have enormous untapped potential, who can change their lives and our economy. I believe they deserve a chance—to learn for free, to have a living-wage career, to have the skills and access that equity demands. How does Byte Back use technology to address the digital divide and seek solutions to poverty? Access to technology is extremely important. But I think that sometimes we overlook the importance of providing people with the training to use that technology. A laptop or access to broadband isn’t enough if a person doesn’t know how to access the internet on their device or connect the device to Wi-Fi. So, we teach people to use the technology that’s so ubiquitous now, and by doing so, we’re helping them lift themselves out of poverty. With tech skills, our students are able to create resumes in Word, fill out online job applications and compete for in-demand jobs in the new economy. As the organization celebrates its 20th anniversary, what are some of the goals you and Byte Back are working towards? As of this summer, we’ve achieved a major 20-year anniversary goal—to move into a state-of-the-art consolidated headquarters. We spent our first 20 years in a converted row home, and we really outgrew that space. Our move is a huge step up for us. We have new technology, including new computers for students and staff and a new video production studio, and a space that really reflects the careers that our students are training for. For most students, these will be the best classrooms and technology they’ve used in their lives, and they really deserve it. The number of Byte Back graduates who are hired into living-wage jobs continues to increase. In our last fiscal year, which ended in June, 65 students were hired. On average, our graduates who are hired are making $28,000 more per year than they were before Byte Back courses. As we expand into Maryland this year, we’re teaching more advanced CompTIA A+ Certification courses, which means more graduates will have the training to succeed as IT help desk professionals. Our services are unique nationally, and communities across the country are asking for Byte Back services, so we know that our 20th year is the first in our geographical expansion, but not the last. How do you rally people to get off the sidelines and support Byte Back through donations, volunteering, partnerships and hiring students? We have so many fabulous supporters who are so inspired by our mission and our students’ success. The DC tech community has been so supportive, and we’re such a natural tech for good cause for them. In March, we won a $360,000 WeWork Creator Award to scale, which has been so huge for us. We have the support to expand, and a lot of new supporters have found out about our work and are joining us as partners, volunteers, funders, donors, and student employers. We have a lot of new supporters, but we’re always looking for more to join us as partners, volunteers, funders, donors, and student employers. We have opportunities to get involved and Get in the Arena at byteback.org. How do you and your team view technology as a pillar of civic engagement? The people reading this article right now online probably cannot fathom not knowing how to use the internet, or how to use an Excel spreadsheet, or email a city official. But the fact is there are still millions of people who are being left out of digital civic life. While online-run social justice movements have had amazing success, it’s a fact that many people are left out of participating and engaging and fighting because of their inability to use technology. How have you had to challenge assumptions and take risks during your time at Byte Back? When I started at Byte Back as Executive Director, I inherited an organization that had grown exponentially in the past seven or eight years but didn’t necessarily have the systems and processes in place to keep up with this growth. I really had to question my assumption that programming and staff and systems were put in place for a reason – I had to start asking why we did things a certain way, why we conceptualized our organizational structure the way we did, why certain individuals were placed into their roles. It was challenging, but Byte Back embraced the change and need for us to grow and evolve, and we’ve significantly improved our operations and our organizational culture over the past two years. Are there any student success stories that stand out and inspire you to continue getting in the arena for adult technology training? The first time I met Olivia Byrd, she came up to me and said, “Byte Back saved my life.” Four years ago, Olivia was living in her car. She didn’t have the skills and experience to build a career. And then Olivia came to Byte Back. Three months after finishing her training, Olivia was hired as an IT Help Desk Technician. She now has her own apartment. Olivia’s life has not only been changed, but she brings a new face and perspective to the tech world. Thank you so much to Elizabeth Lindsey for sharing how she’s Getting in the Arena with us. To learn more and get involved with Byte Back, check out their website. And to learn more about our 20th anniversary celebration, check out our Get in the Arena page.